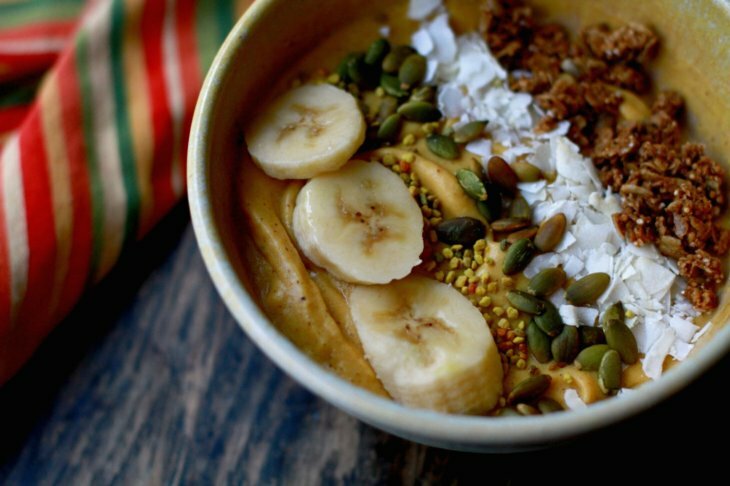 This recipe takes the whole pumpkin spice thing next level — with a creamy and delicious Pumpkin Spice Smoothie Bowl. 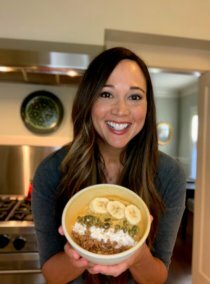 I like to use a combination of frozen banana and mango for sweetness, and then add pumpkin spice, as well as turmeric for some extra anti-inflammatory power. Then, we add some real pumpkin puree for additional fiber and beta-carotene (for healthy eyes and glowing skin). Add the frozen banana and mango to a high speed blender. Pour the liquid over the frozen fruit, and blend, using the tamper tool to keep things going. Blend until the fruit has broken down, then add the pumpkin, almond butter, spices, and vanilla. Blend until smooth, using the tamper tool as needed, until the mixture resembles soft serve ice cream. Transfer the mixture to a bowl using a rubber spatula, and smooth out the top. Garnish with your choice of granola, and additional toppings.